Mumbai, Nov 25: Substitute Thiago Dos Santos struck late as Mumbai City FC edged past FC Goa 2-1 in a Hero Indian Super League (ISL) clash at the Mumbai Football Arena here on Saturday. Everton Santos put Mumbai City ahead in the 59th minute, only for Manuel Arana to draw level in the 83rd. But just when fans were thinking the match would end in a stalemate, Santos scored the winner in the 88th minute. 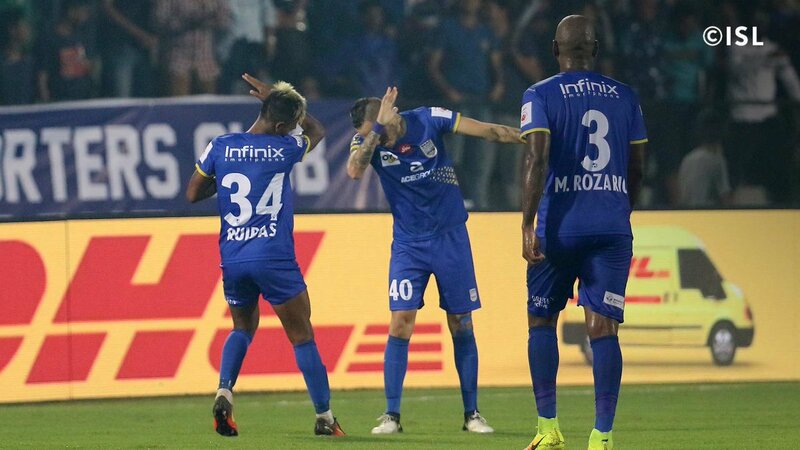 It was Mumbai City's first win after an opening round loss against Bengaluru FC, and the first loss for high-flying FC Goa who had defeated Chennaiyin FC. The frenetic end to the clash and the two goals in the last seven minutes provided plenty of entertainment, in contrast to the first half where no goals were scored. Goa had plenty of ball possession but couldn't create too many goal-scoring chances. The best chance came in added time when Ferran Corominas Telechea was denied by the Mumbai goalkeeper Amrinder Singh with a stunning save. Mumbai too had their chances but Balwant Singh lacked sharpness in front of goal. In the second half, however, the game sprang into life. Mumbai's opening goal was a gift from FC Goa as goalkeeper and captain Laxmikant Kattimani failed to clear a regulation back-pass from Defender K. Chinglensana Singh at the hour mark. Kattimani allowed Santos to charge at him, and as he went for a slide, the ball deflected off him into the goal. FC Goa didn't expect the setback at that stage and tried to fight their way back. They managed to find the back of the net after a brilliant one-two with Corominas finishing it off, but the goal was ruled offside. Goa's disappointment turned into joy in the 83rd minute. Arana scor ed the equaliser as Seriton Fernandes lobbed a long ball in his direction and the Spanish attacker rushed forward to bury it past Amrinder. There was one more late twist to the game as Mumbai grabbed the winner in the 88th minute. Santos did all the hard work and found Thiago on the right. The substitute skipped past two defenders and then scored from an acute angle past Kattimani.